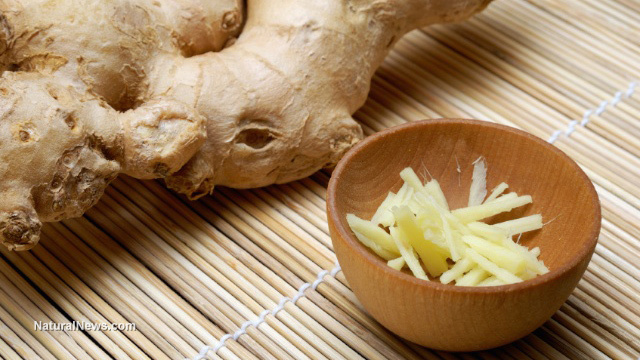 (NaturalNews) According to numerous studies, ginger possesses many therapeutic properties. It's most widely known for its ability to alleviate symptoms of gastrointestinal distress, including seasickness. A study released in 2007 revealed that ginger actually treats symptoms experienced in conditions like motion sickness better than some over-the-counter prescription drugs. Ginger's ability to relieve nausea, dizziness, vomiting and cold sweating makes it a popular choice for treating an upset stomach which is frequently experienced by expectant mothers. This flowering plant also contains potent anti-inflammatory compounds called gingerols, a substance that can help reduce pain in people with osteoarthritis and rheumatoid arthritis. When consumed regularly, it can even improve their mobility. Researchers from the University of Minnesota's Hormel Institute found that gingerols may inhibit the growth of colorectal cancer cells after providing the herb to mice specifically bred to lack an immune system. Scientists fed the mice half a milligram of gingerol three times a week before injecting them with human colorectal cancer cells. After 15 days, 13 tumors were found in the control group (meaning they were not given gingerol) compared to just four tumors identified in the group that received gingerol. By day 38, one mouse in the gingerol-receiving group still had no measurable tumors; however, all of the control group mice were eventually euthanized because their tumors had grown to one cubic centimeter (0.06 cubic inch). It's clear that ginger has some amazing healing capabilities. Similar to turmeric, it works great medicinally, but is also a staple in many fine-tasting cuisines. Ginger is incredibly versatile, meaning it can be used in many types of food. One of the most popular uses for ginger is for desserts. Ginger cookies, gingerbread, ginger waffles and even cocktails are just a few sweets you can make using this herb. The website BuzzFeed provides the perfect list of delicious recipes, some of which include maple-ginger roasted pork tenderloin, ginger-chicken meatballs with Chinese broccoli, ginger-apple pumpkin soup and ginger-garlic cocktail meatballs. Luckily, keeping fresh ginger around the house is a lot simpler than you might think. This herb is super easy to grow. Some conditions that ginger absolutely loves are a sheltered spot, filtered sunlight, warm weather and humidity. Ginger also enjoys rich, moist and loose soil. Ginger does not thrive well in frost, direct sunlight, strong winds or soggy, waterlogged soil. While commonly called "ginger root," the part that we actually harvest and eat is called a rhizome. The best way to start a ginger plant is to get a rhizome from a friend; however if you are unable to,you can purchase one at the grocery store. Make sure to select a rhizome that's fresh and plump. It may be a good idea to soak store-bought ginger root in water overnight, as it may have been treated with a growth retardant. Ideally, it's best to select organic ginger.However, if borrowed from a friend, let it dry for 24-48 hours before planting into a medium-sized, well-draining pot. Good soil and compost is critical for starting a ginger plant. It's also important for the plant to be free-draining so it doesn't become waterlogged. Nutrient-rich compost will keep ginger moist. It's best to plant ginger in the late winter or early spring where the herb is protected from wind and can receive indirect sunlight. Mature ginger requires eight to 10 months of growing; however, some say you can begin stealing tiny bits of root around four months. The best time to harvest is when the leaves die down. When your ginger plant is ready to harvest, simply use a small shovel to dislodge the root, separating part of it for use. You can replant them right away and/or keep the rest for the kitchen. Ginger keeps best if you keep it in its natural casing; however, you can also peel, chop and freeze it.